Lookout! 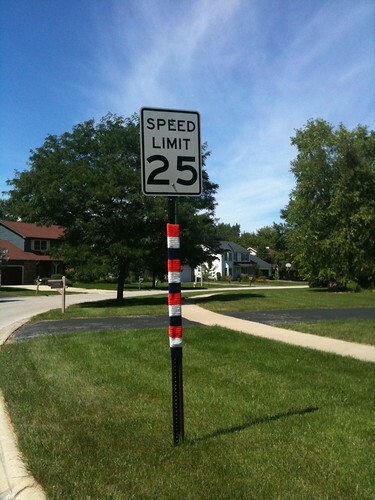 It's a Yarn Bomb! A crocheted yarn bomb! It's been there for a few weeks now, and hope it stays forever. I think the subdivision looks much better with this yarnie addition! I have some very big news to share. . . . I am now under contract with Martingale and Company for a knitting pattern book! Someone please pinch me, I cannot believe it! When I submitted my proposal back in March I didn't really think it would happen. I honestly thought, oh, this is never going to happen. At least I'll have a few patterns ready to go in my Ravelry shop when I get rejected. I am delighted, my dear fiance, Alex is delighted (and willing to accept that the first three months of marriage I will be ignoring him and working on my book) and I hope all of my dear blog readers are delighted!